It's an important reminder that investing is simple but not easy. In 33 of the last 39 years, the S&P 500's annual total returns (appreciation + reinvested dividends) have been positive, including 2018 year-to-date*. Pretty basic concept: Stay invested and typically you'll be rewarded. Now look at the yellow dots for each year representing the fluctuation, or volatility, in the market. On average, the maximum intra-year decline each year since 1980 has been -14%. That kind of fluctuation is an emotional roller coaster for most investors. 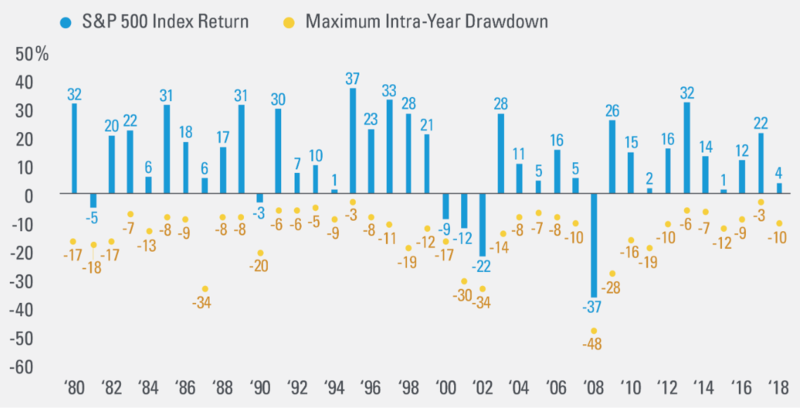 Even during the positive-return years since 1980, the average maximum drawdown in the index has been -11%. Volatility like this can cause investors to bail out of the market at the worst possible times and forego longer-term returns. If investing meant only seeing the above blue bars at year-end, it'd be a lot easier; it's the ride that can make it difficult. Being a good investor means accepting that volatility is a part of the markets. If the stock market increased day after day with no drawdowns, there wouldn't be any risk for investors to be rewarded for taking, and stocks would likely become overpriced to the point that returns would be minimal at best and completely crash at worst. As demonstrated above, you're often rewarded for sticking with your portfolio through the good times and bad. Diversify, think long-term, and rely on discipline over emotions. Investing can be difficult but incorporating these concepts into your investment approach can make things a little easier. *2018 data represents year-to-date performance through 10/11/18.